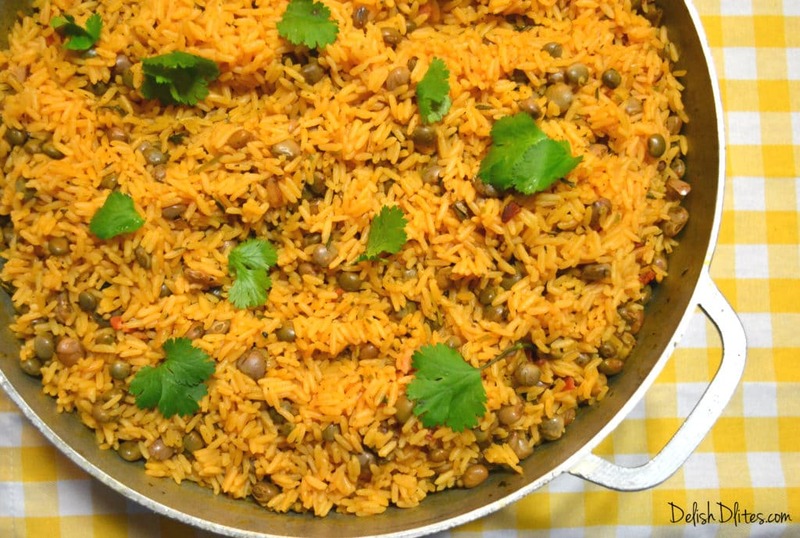 There’s nothing more quintessentially Puerto Rican than arroz con gandules. It’s part of our national dish (along with Pernil). For holidays, birthdays, baby showers, and more, if there’s a party, this dish will be there. Everyone has a little twist on how they prepare this dish, but here’s my version. translated into cauldron. It’s similar to a Dutch oven, but instead of being made from cast iron, it’s usually fabricated from aluminum. Every self-respecting Puerto Rican household has one. They’re passed on, generation to generation, much like cast iron pans are. The tapered edges and rounded bottom allows for steam to circulate through the rice, and produced a fluffy texture that is more difficult to achieve in a regular stock pot. These pots are also great for braising meats, stews and soups, and are oven safe (with a metal knob). 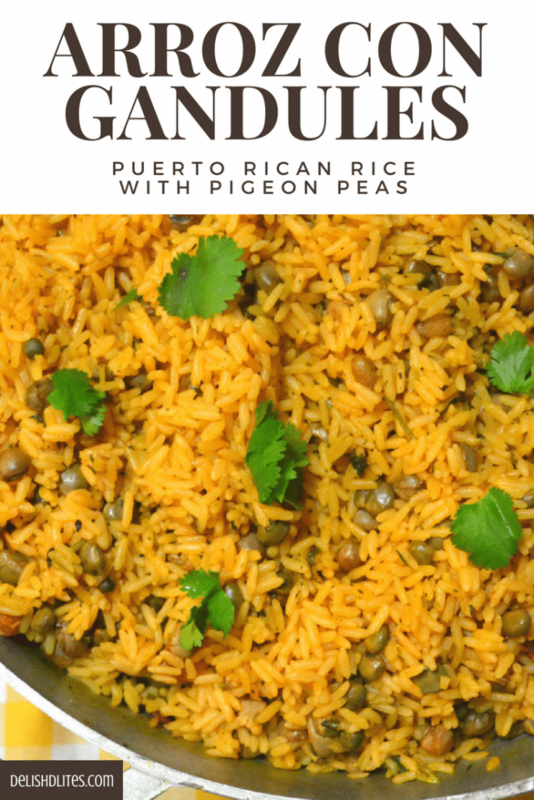 Gandules (aka pigeon peas) are an exotic ingredient to most folks outside of the Caribbean. Pigeon peas, popular throughout the Caribbean West Indies, are small, oval beans with a nutty flavor. They can be found fresh, frozen, canned or dried. They are a bright green color when fresh. If you can get them fresh or frozen (I’ve found them in NJ Latin food markets), go for it, they’re even more flavorful and nutty. If you can’t find them, you can substitute with canned pinto, pink or red beans and it’ll still be delish! Parboiled rice is my favorite for this recipe because it’s almost impossible to end up with mushy rice. You want the grains of rice to be loose and not sticky. Parboiled rice has been partially cooked, so some of the starch has been removed. This makes the rice less sticky, which is this case, is exactly what we want. This recipe freezes very well, so make a big batch and portion it into storage bags for a quick weeknight side dish. To reheat, transfer into a microwave safe bowl and cover with plastic wrap. Microwave for a few minutes, stirring occasionally until the rice is hot & fluffy. 1/3 cup sofrito homemade is best! Heat your caldero or Dutch oven to medium heat, and add your olive oil, bacon/ham (if using) and sofrito. Stir constantly until fragrant and tender, but not browned, about 4 minutes. Next add in the Sazon, tomato sauce or paste and chicken bouillon. Stir to combine. Add the Italian seasoning, cilantro (if using), bay leaves, olives (if using and water/broth. Allow the liquid to come up to a boil, and taste it for salt. If it needs more saltiness, add in another chicken bouillon cube. You want this liquid to be highly seasoned, as it will determine the final seasoning of the rice. Add in the drained pigeon peas, then bring the mixture back up to a boil. Once the mixture is boiling, add the rice. 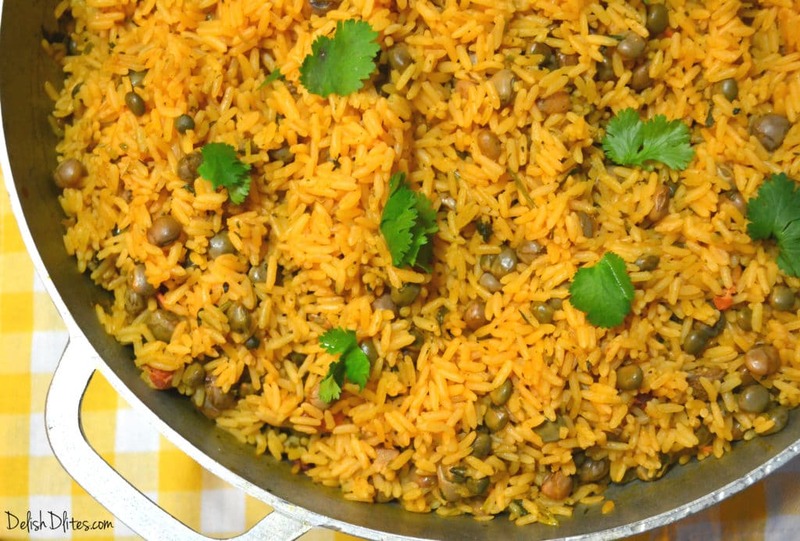 Stir the rice to get it submerged and distribute the pigeon peas throughout. Allow the rice to absorb all the visible liquid, uncovered. Once most of the visible surface liquid is absorbed, stir and cover the rice, lower the flame to low, and allow it to steam for 20-25 minutes. It's done with all the liquid is absorbed and the grains are fluffy and fully cooked. Unfortunately no, you have to use dry, uncooked rice for this recipe. Hi, I was wondering if this would work with Jasmine rice? Hi Kayla, yes Jasmine rice would work nicely but you should definitely rinse it before using it. can I use smoked turkey neck instead of the ham? Or do you have any other suggestions ? I also used the sofrito in the jar is that ok? Hi Marie, a smoked turkey neck would be delish! I have also used bacon and kielbasa sausage, both work great. Sofrito in a jar is perfectly fine too. Prepared the rice exactly per your instructions and it’s perfect every time. 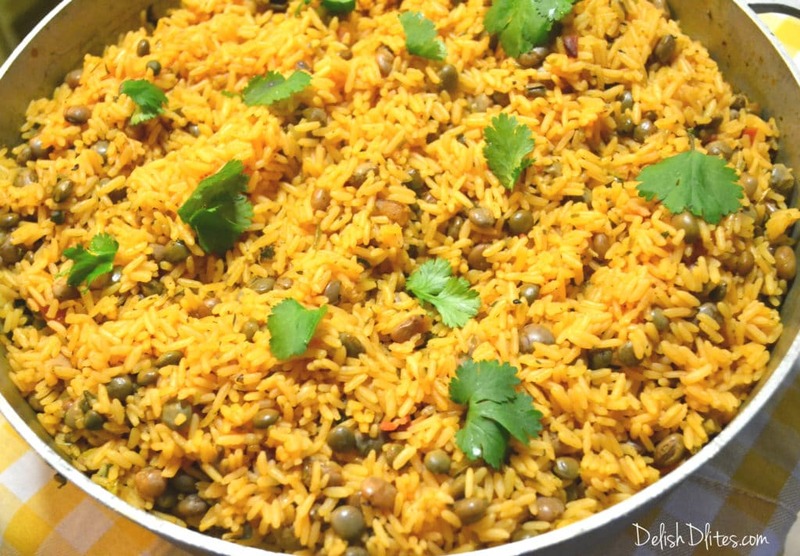 It’s nice to give the potatoes a break and enjoy arroz con gandules! Thanks Jim! I’m so glad you enjoyed the recipe! That is THE best compliment ever! Loved loved looooved this! My boyfriend Is puertorican and has been dying for me to cook him some authentic food. I tried it last night and it was a hit! It took him back to his parents cooking. Thank you so much! You are phenomenal! Btw I used your sofrito and it’s super easy/flavorful. Thank you Maddie! So glad you and your boyfriend enjoyed the recipe! With this recipe can I add chicken to the pot?? Hi Latricia, yes you can! Sauté it with the sofrito and spices and then go from there. Hello, I want make this recipe for a party of 30. How much rice and how much water would I need. Hi Karina, my recipe feeds about eight so in your case I would quadruple it. 1 cup of rice, 1 & 3/4 cup water. HI! I am new to cooking Puerto Rican food so please forgive me if this is a dumb question… what kind of tomato sauce are you putting in the recipie ? When I think tomato sauce I’m thinking Italian tomato sauce but your pics look more like a paste.. I just want to make sure I am doing it right! Thank you so much!! I use plain tomato sauce not pasta sauce, you can find it in the canned tomato aisle by the tomato paste. I’ve already made your recipe 3 times in 2 weeks! Amazing!!!!!!! Hello. I’m going to be making this dish for approx 80 people so I want to cook 20lbs of rice 10lbs at a time. I’m going to be using dried grandules. That isn’t my issue though. How much liquid did you use to make the 10lbs of rice. I know long grain rice usually has a 1:1 ratio but what is the rice to liquid ratio for parboiled rice. Hi there,.. I was married to a Puerto Rican man for 20 years.. His mother made the best food ever! She liked using small grain rice.. which I love too.. I remember her rinsing the rice many times before putting it in the pot. I am wondering if they produce parboiled short grain rice? I haven’t seen it Dorothy but if you find it let me know where! I need to make a big batch, enough to feed 40 people. Should I keep the amount of water equal to the rice (2 cups rice needs 3.5 cups water)? So 8 cups of rice will require 14 cups of water? Or does the water get slightly reduced when making a large amount? Hi Carolina, rice recipes don’t scale up exactly, but your ratios are a good place to start. If you end up needing more liquid, you can add it in after the rice has absorbed most of the initial liquid. Parboiled rice is very forgiving. 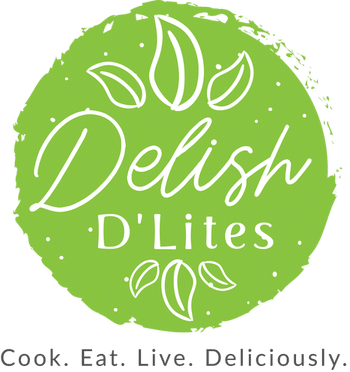 I updated the recipe, thanks for letting me know about the discrepancies! Was so nervous about using parboiled rice, made this and it is awesome! Thanks Michelle! I think parboiled rice is the best for people who are afraid of cooking rice. It comes out great every time! Thank you so much for the tip about the rice! Growing up, my Puerto Rican mother always made arroz con pollo and the rice was never mushy. She never measured the rice just poured into the liquid and knew when it was enough and cooked to perfection. I had forgotten she used Uncle Ben’s brand of rice until I read your recipe. I’ve made arror con gandules with several different brands of rice trying to achieve the texture and consistency of Uncle Ben’s rice. I never could get it right and then I tried your recipe. Aaaahhh, it turned out perfectly! The consistency is exactly how my mother’s rice would turn out. From now on, I will only use parboiled rice. I made this tonight. Overall it was an extremely good dish. I will most likely halve the cilantro the next time. I’m not that accustomed to its strong flavor. 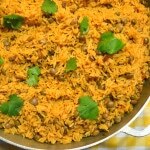 I’ve watched the mamitas of my Puerto Rican friends in New York City make arroz con gandules and they never used cilantro in anything they cooked, not in the arroz con pollo nor guisos nor anything but in America now on tv they always promote it in Cuban and Puerto Rican dishes but I’ve never seen it used. No chance anybody put it in and served it to me to fool me, because that strong soapy taste is really harsh if you’re not used to it. Also, if it’s eliminated the dish will still be delicious. Hi Phyllis, you are correct, cilantro is not the most traditional ingredient in this recipe, as culantro is the preferred herb of the island. Similar in flavor, it looks like broad wide leaves, almost like dandelion leaves. Since that is rather difficult to find unless you have a Latin market in your area, I substitute cilantro most of the time for ease. Did you know, about 8%-10% of people find that cilantro tastes like soap to them? It’s a generic phenomenon! As you mentioned, the dish is perfectly fine without it, I just love the herby freshness if gives the dish. Thanks for stopping by! How much adobo do you use? It’s really to taste depending on the saltiness of your other ingredients, I would treat it like salt and adjust your recipe accordingly. I never heard of the ham in sofrito either. Maybe she was talking about the ham in the recipe. You know when you buy GOYA Recaito, it is the same ingredients as making homemade sofrito. Maybe that is why the dish came out so good! I have been making rice and gandules for years, but I tried it this time with your chicken bouillon, good idea. I used Long grain rice and measure by eye. Then, I put my rice in before the water. I stir the rice inside of all the seasonings and beans and let it take the flavors, then I add the water. It makes a difference. But Great Recipe! Hi, I wanted to ask you I’m making arroz con gandules for about 20 people how many cups of rice is that? And also how would I change the recipe for that much rice? 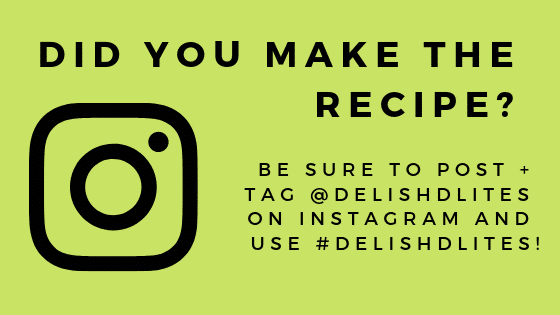 My recipe feeds 6-8 people so you can multiple everything by 2.5. One cup of uncooked rice becomes about 2.5 cups of cooked rice. Question, if I double the recipe do I double the time for steaming? That’s a good idea Jane, yes cook time will take a bit longer. I like putting a piece of smoked turkey in pot.. adds some nice flavor. I never heard anyone using ham in the puerto rican sofrito .I come from a really huge puerto rican family and we all make our own sofrito not one of us uses ham or any protein but ppl have different ways of making it . Hi Maria, I don’t use ham either. I sm going to try it maybe it will come out as good as when i was in puerto rico when i was young i use to cook dishes like this. Homemade sofrito is only veggies but people do put ham in the dish to add a meat flavor but it is good by itself. I’d only be worried about having sofrito sit in the fridge for days with meat in it. If you make it with ham, I suggest freezing portions in little cups or ice cubes so that it stays fresh until you’re ready to use it. That right , we don’t used ham in our Sofrito, what r they talking about. Sofrito in a jar is made with pork. It’s listed in the ingredients list. Using Recaito or making homemade Sofrito works best. Next week is my neighbors 70th birthday party. I wanted to make something rather authentic to take and found your site. YAY!! I am planning to bring this this rice dish along with your Pernil recipe. I’m pretty confident on the Pernil but wanted to make the rice at least once before hand to make sure I got it right I purchased a Caldero, which personally I think that made a world of difference, and using the parpoiled rice I have to say I have achieved rice perfection like my neighbor (now I know the secret.) While I can’t say I did true justice to this dish, I think I did a pretty good job. Lovely dish with well developed flavors. Thank you for sharing. This make me so happy! Comments like this are the reason I made this blog, I’m so glad you enjoyed the recipe. Hi Ivonne, I’ve never tried it, but it’s worth a shot! Let me know how it goes. I’ve used the brown rice and it is just a delicious and healthier. You mentioned that you didn’t use ham because the guests you made it for didn’t eat pork. Sofrito has pork in it, therefore I used Recaito. It came out great! Hi Bisa! That’s awesome! My sofrito doesn’t have any protein, it’s just veggies. can u pls let me know which rice u have used here? Am in Canada and love the long grain boiled rice but don’t know which brand to buy other than uncle bens???!!! Hi Ginelle! I use parboiled rice (that’s the type of rice) because it’s had a bit of the starch removed, so it prevents the rice from sticking. If you use regular long grain white rice you’ll want to use a 2-1 ratio for the liquid to rice.